The HC series of refrigerators are designed for storing large quantities of a variety of materials at cryogenic temperatures. Temperatures generally range between -196°C (-320°F) at the liquid surface, and -190°C (-310°F) at the canister top. 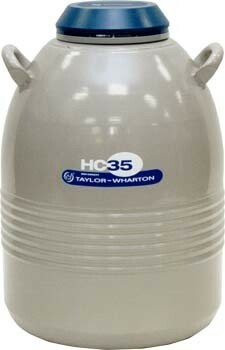 Every HC series dewar is backed by a 3 year warranty when purchased from L&G Cryogenics. Static Holding Time: 60 Days Weight Full: 43 lbs. Working Time: 37 Days Neck Diameter: 3.6 in. 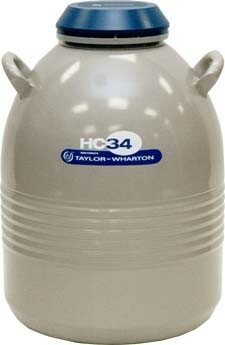 Evaporation Rate: .20 Liters/Day Overall Height: 19 in. 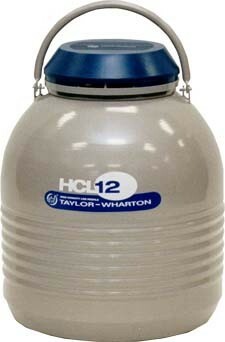 Liquid Nitrogen Capacity: 12 Overall Diameter: 15.6 in. 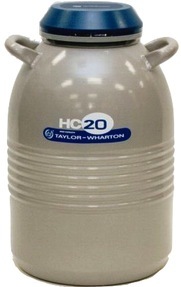 An optional Low Level Cryo Sentry Alarm is available as an add-on. Static Holding Time: 87 Days Overall Height: 24.25 in. Working Time: 54 Days Overall Diameter: 15.6 in. Static Holding Time: 130 Days Overall Height: 26.8 in. Working Time: 81 Days Overall Diameter: 18.8 in. Static Holding Time: 200 Days Overall Height: 26.31 in. Working Time: 125 Days Overall Diameter: 18.8 in.